You would probably assume that anything that either Les Claypool or Sean Lennon get involved in is going to be weird. Since their debut album is called Monolith of Phobos and the first single is "Cricket and the Genie (Movement 1, The Delirium," you're right. It's weird. But, it's easy to forget that both Lennon and Claypool have some serious pop sensibilities. Primus have had some moderate hits, and Sean Lennon's Into the Sun was one of the most underrated albums of the late 90s. The song is pretty bouncy, with a killer grooved out bass line (of course,) and while it is trippy, it's trippy in a pretty normal way. If there was still a thing as modern rock radio in 2016, this would be a candidate for song of the summer. So it's weird, but it's not that weird. Except for the flute solos. Flute solos are pretty much always weird. The Claypool Lennon Delirium's debut album (which also features Money Mark on keyboards,) Monolith of Phobos, is due out June 3 on ATO Records. You can listen to "Cricket and the Genie (Movement 1, The Delirium)" below. 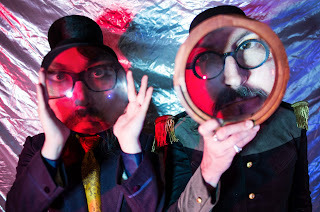 For more information on The Claypool Lennon Delirium, check out their website or Facebook.